Home fans expecting a close match at Stark's Park will have been pleasantly surprised by the ease with which Raith Rovers swept past Dumbarton. The visitors were the form team in the division, unbeaten in seven, and were seconds from victory the last time the sides met in a 2-2 draw last month, but they were comfortably dismantled in one of Rovers' most domineering displays of the season. The criticism from manager John McGlynn, who branded his team 'not good enough' on Raith TV after last week's defeat at Forfar, may have ignited a fire under his players as they showed the ruthless competitive streak that will be required if they are to win promotion via the play-offs. While the opposition will be tougher, this was nonetheless the type of committed performance that bodes well for the end of season showdowns, although the real tests will come in the remaining away games, starting at Bayview next week against an East Fife side protecting an unbeaten record against their Kirkcaldy rivals this season. The reintroduction of Ross Matthews and Jamie Gullan to the starting line-up brought a fresh energy and drive, as well as providing more support to the front two, Kevin Nisbet and Liam Buchanan, who in turn produced one of their most effective displays, both in terms of their goals and all-round link-up play. Dave McKay dropped back out of the team as Grant Gillespie returned to right-back, with Euan Murray moving to centre-back. Tony Dingwall was the other change from the starting 11 that lost in Forfar having suffered ankle ligament damage. Before kick-off, the stadium paused for a poignant minute's silence in remembrance of former director and lifelong fan Alec Condie who passed away recently. The match itself started quietly, except for the Dumbarton drummer, until Raith manufactured a brilliant opener on nine minutes. The quality of the move was matched by the finish as passes were sprayed through midfield before Callum Crane's cross was rammed into the net by Matthews with a well-executed first-time volley from 14 yards. This strike was matched on 26 minutes when Gullan broke into space via a Nisbet flick-on, and although he was stopped in his tracks by the Dumbarton defence, the ball broke to Buchanan who steered a sublime left-foot effort beyond Grant Adam from the edge of the area. 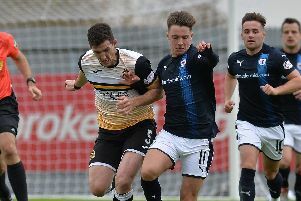 Rovers were cruising and perhaps got a little too comfortable, losing focus for a spell with giveaways in possession that allowed Dumbarton to venture forward, leading to them pulling a goal back on 38 minutes when Bobby Barr hit the by-line and cut back for Calum Gallagher to score from six yards. The home response was a positive one as Rovers restored their two-goal lead on the stroke of half-time, albeit Nisbet was the beneficiary of some suspect goalkeeping as he nodded home Jamie Barjonas cross with Adam caught in no mans land. 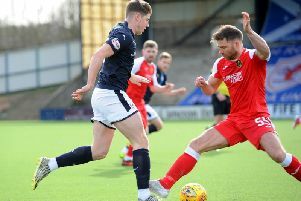 It was a goal that allowed Raith to approach the second half positively, although there was a fortunate escape two minutes after the restart when an unmarked Gallagher failed to properly connect with a Barr cut-back and the ball bounced out of play. Rovers took any remaining pressure out of the game with a fourth goal on 55 minutes, Nisbet stooping to head home the rebound after Gullan had drove into the box and forced Adam to parry his powerful drive. Nisbet is now on 28 goals - already Raith's best individual tally for many a year with six weeks of the regulation season left. The crossbar prevented Buchanan's glancing header from making it five just a minute later, before Nat Wedderburn was forced off with a calf injury, replaced by McKay, with the subsequent reshuffle seeing Gillespie move into midfield, and Murray to right-back. The early indications are that the injury is not serious, and with four first team players already sidelined, Rovers will certainly hope that proves the case. Dumbarton had nothing to offer in terms of a response and Rovers were able to coast towards full-time in relative comfort. After the Forfar defeat last week, this was a timely reminder of the team's capabilities when they apply themselves properly.